Call it the Mother Road of the Palmetto State - our Lewis and Clark Trail, Appian Way and Route 66 all rolled into one. 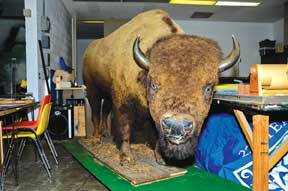 The ancient Cherokee Path played a vital role in the cultural and natural history of South Carolina. 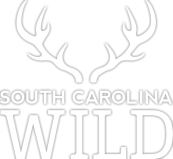 One thing I have learned after more than twenty years of researching and writing feature articles for South Carolina Wildlife is that there are still many great things out there waiting to be discovered. 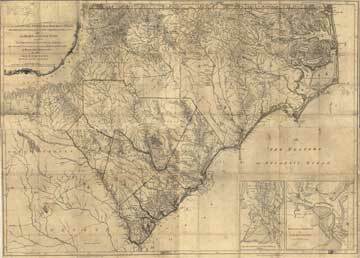 Once, on a years-ago visit to my friend Tommy Charles at his office at the state Institute of Archaeology and Anthropology in Columbia, I spotted an old framed map on the wall that Tommy explained was "Mouzon's Map" of South Carolina from 1775. Among other things, the map showed the entire route of the Cherokee Path from the Charles Town peninsula to the Chattooga River. "You can get one across the street at the South Caroliniana Library," said Tommy, like it was no big deal. No big deal? I literally ran across Pendleton Street, dodging traffic and undergraduates all the way to the USC Horseshoe and paid thirteen bucks for a photocopy of the map that would launch me and my wife Jane on an unforgettable five-year odyssey. With a copy of Mouzon's map and a state road atlas in hand, and a love of history and an unbridled sense of adventure to motivate us, we embarked on a quest to retrace the route of the Cherokee Path. If you spend enough time reading about the early Colonial history of the Palmetto State, you will inevitably come across vivid accounts of the Cherokee Indians from the "Lower Towns" of the Upcountry trekking down to Charles Town. You'll also discover that during two Cherokee Wars (Montgomery's campaign in 1760 and Grant's decisive campaign the following year), impressive armies of more than a thousand men somehow found their way through the wilderness to the Lower Towns and on to the Cherokee "Overhill Towns" in eastern Tennessee; but how, exactly? About the only thing I knew for certain was that the Path once cut a roughly diagonal line across the state between the Chattooga River at Earl's Ford in northern Oconee County and downtown Charleston. Mouzon's map shows the Cherokee Path beginning (or terminating, depending on whether you were coming or going) at the southern tip of the Charleston peninsula. 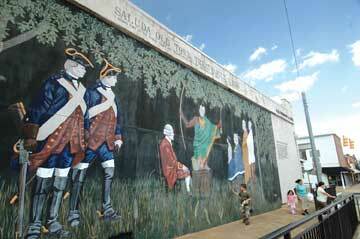 In the early 1700s, Charles Town was a walled city, largely confined to the southern end of the peninsula. What is now King Street was, in fact, the route of the Cherokee Path. Very early in the history of Charles Town, the dirt trail was widened and improved to early road standards and became known as the Broad Path. Mouzon's map shows the Broad Path splitting a few miles out of town - the left fork heading to old Fort Dorchester and points west, and the east fork leading to the settlements of Goose Creek and Moncks Corner. 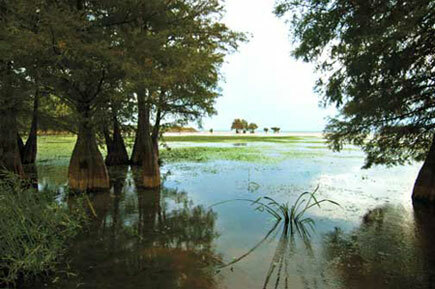 From Moncks Corner, the route followed the western bank of the Santee River, and in some places it now lies under the catfish-filled waters of the Santee-Cooper lakes. Near the Cross community in Berkeley County, a marker erected by the county Historical Society notes that the Cherokee Path "passed near here." Farther up the road, the Path went by Eutaw Springs (also now under water), the site of the last major engagement of the Revolutionary War in South Carolina. A map of the battleground clearly shows the Cherokee Path passing near the springs. Continuing upriver, the route would have taken travelers directly past a prehistoric Santee Indian ceremonial mound, now known as Fort Watson, with its own interesting Revolutionary War history. 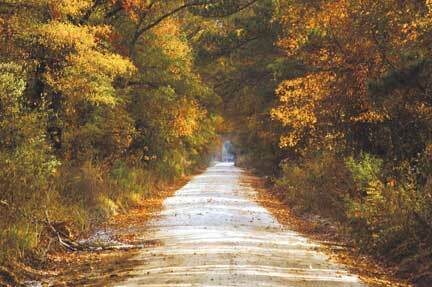 From there, the Path headed for St. Matthews in Calhoun County. An old map of Amelia Township, later St. Matthews, shows the Cherokee Path running right through the middle of town. 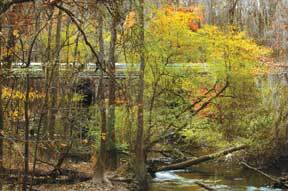 From St. Matthews, it continued up the river, heading straight for what was known at the time as "the Congarees," just south of the modern day city of Cayce at the confluence of Congaree Creek and the Congaree River. Here, at the ancient village of the Congaree Indians, the trail divided again, with the Cherokee Path bearing west and the trail to the Catawba Nation heading north. Owing to its strategic location, the Congarees boasted one of the earliest trading posts in the interior of the young South Carolina colony. In modern-day Cayce, right in front of Brookland-Cayce High School on State Street, another marker notes that the Cherokee Path to this point became the first "State Road" laid out by the Board of Public Works in 1820. From Cayce, the Path followed the high ridge leading towards modern-day Lexington. A historical marker near Leaphart Road and U.S. Highway 1 notes the intersection of the Cherokee Path and another trail leading to New Windsor Township on the Savannah River. In Lexington, the Path apparently ran along the same route as modern-day "Cherokee Drive." Just a few miles from there, the trail again disappears under the waters of another man-made lake - Lake Murray - before emerging on the western shore near the Little Saluda River, roughly ten miles outside the present-day town of Saluda. Here, at a Saluda Indian village known in records as "Saludy Old Town," one of the first treaties between the Cherokees and Colonial Governor James Glen was signed. It was Governor Glen who first recognized that establishing an alliance with the Cherokees was "key to Carolina." It was also in Saluda that Jane and I first met Roy Vandergrift III, a retired history teacher who has spent decades researching the Cherokee Path. Some of Roy's work can be found on the website of the South Carolina Genealogical Society at www.scgen.org/path.htm. From Saludy Old Town, the Path followed the high ground in the direction of Greenwood, but detoured to the nearby village of Ninety Six. Ninety Six, shown on surveyor George Hunter's 1730 map by the simple notation, "96," was an important crossroads intersection of Indian trading paths and played vital roles in the settlement of the interior of South Carolina and the Revolutionary War. A trip to the Ninety Six National Historic Site, where a perfectly preserved segment of the Cherokee Path is clearly marked, is well worth the trip. From Ninety Six, the Cherokee Path went to the historic Boonesborough Township between present-day Donalds and Due West, home of Erskine College. According to Dr. Lowery Ware, a retired professor of history at Erskine, the Path crossed Highway 184 just outside of town near (appropriately enough) Cherokee Trail Elementary School. Northwest of Boonesborough, the Path crossed a creek known to the Cherokees as "Yellow Water" and to the settlers as "Corner Creek." A trading post located here and known variously in old records and on early maps as Dew's Corner, DeWitt's Corner, Dewisse's Corner and Duett's Corner eventually gave Due West its name. The trading post at "DeWitt's Corner" was the site of a game-changing treaty that ended the Cherokee War and stripped the Cherokees of much of their territory in the Upcountry of South Carolina. A survey line cut from the trading post to the Savannah River in 1777 still forms the border between Anderson and Abbeville counties. From Due West, Mouzon's map indicates that the path led to the historic town of Pendleton, and from there crossed a series of streams named by early traders for their estimated distance from the Cherokee's principal village, Keowee. You can still locate Three and Twenty Creek, Eighteen Mile Creek and Twelve Mile Creek on maps. The roadbed where the Path forded Twelve Mile Creek can still be seen, deeply incised into the landscape in the woods near the stream crossing. From Twelve Mile Creek, the Path climbed out of the floodplain to the present-day town of Six Mile, named for a nearby stream located six miles from Keowee and the frontier fort, Fort Prince George, both of which are now under Lake Keowee. The Pickens County Historical Society has recently revived long-standing efforts to build a reconstruction of the fort, a key location in the Cherokee wars of the 1760s. From Fort Prince George, the Path turned west and traversed Oconee County toward what we know today as Station Cove, or Oconee Station State Historical Site. From Oconee Station, the Path followed much of the same route as the hiking trail over Oconee Mountain and headed straight for the Chattooga River at Earl's Ford, before leaving South Carolina at War Woman Creek on the Georgia side of the river. From there, it traversed some of the most rugged, intimidating terrain in the Southern Appalachian Mountains, terminating at Fort Loudoun in eastern Tennessee. All told, what Jane and I learned on our excellent adventure still amazes us both. We discovered an entire chapter of South Carolina history told largely in events that happened along the Cherokee Path, a chapter missing from most people's knowledge of how modern South Carolina came to be. We found one of the greatest, most underappreciated and under-utilized resources in South Carolina - the impressive array of small museums, historical societies, and local libraries in crossroads communities and small towns along the back roads of our state. We also discovered that, much to our disbelief, a number of perfectly preserved sections of the ancient Cherokee Path remain intact, after all these years. But above and beyond everything else, we learned that a road more than three-hundred years old can take you on an amazing journey to places you've never been. 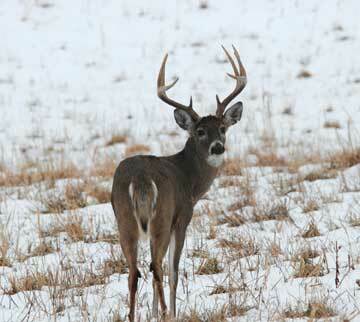 The General Assembly got it right when they designated the white-tailed deer as our official state animal in 1972. 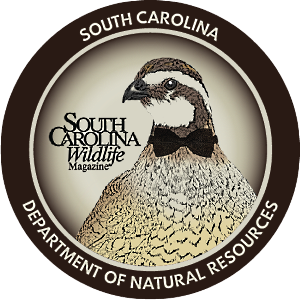 No other creature played such a fundamental role in the evolution of the Palmetto State from a fledgling colony to a major center of commerce. Historians recognize that it was the early trade with local Native American Indian tribes for deer skins that provided the capital to develop the state's plantation-based economy. As early as 1675, Lord Ashley Cooper, the most proactive of the eight Lords Proprietor, established a fortified trading center a few miles upstream from Albemarle Point, the site we know today as Charles Town Landing. While Lord Cooper never set foot on Carolina soil, he recognized the great economic potential in leather from the hides of the colony's abundant whitetails. In 1699, more than 64,000 deerskins were hauled into Charles Town, and by the very early 1700s the trade had expanded well into the interior of the "backcountry." And it was the deerskin trade that brought the Cherokee Path into prominence in the affairs of the now burgeoning economy of South Carolina. Once a trading center had been established at "the Congarees," the gold rush was on, and deer hides came streaming down the Cherokee Path, first carried by the Indians on their back in bundles, later on horseback, and eventually in wagons and carts. 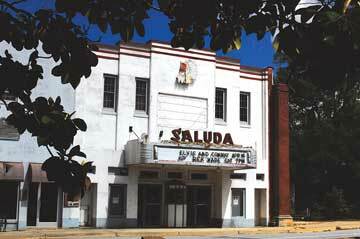 All this commerce led to widening and other improvements along the Cherokee Path, and by the 1750s, trading centers had been established as far inland as Saluda and Ninety Six. Through it all, the white-tailed deer has not only survived, but flourished. It remains today the state's most popular game animal and accounts for millions of dollars spent by hunters pursuing the same animal so eagerly sought by the Cherokees and the early colonists three hundred years ago. Fortunately for us, some of the thousands of early travelers along the Cherokee Path left detailed accounts of what South Carolina looked like in the 1700s. 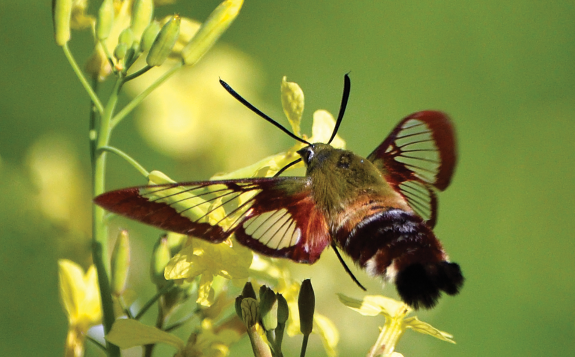 In some cases, these eyewitness reports provide the last evidence of species that have long since disappeared. First-hand accounts of encounters with American bison, or buffalo, in South Carolina in the 18th century are solid evidence that these beasts once roamed the southeastern states. George Chicken (Captain of the militia in Goose Creek, hero of the Yemassee War, and later Commissioner of Indian Affairs), writing in 1716 from his camp on the Cherokee Path near Ninety Six, recorded, "We killd a boflow this day," and in 1753, a Savannah Indian appeared before Governor James Glen in Charles Town bearing a "wampum belt" made of buffalo hair. 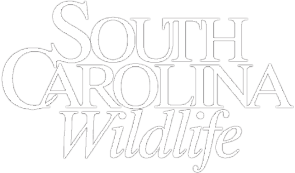 By the mid-18th century, the eastern buffalo was in serious decline, and most early accounts of buffalo in South Carolina are of remnant trails, wallows and salt licks. The Buffalo community in Union County is named for a rock outcropping that was once a prominent buffalo salt lick. Dennis Chastain is a freelance writer and outdoorsman living in Pickens County.